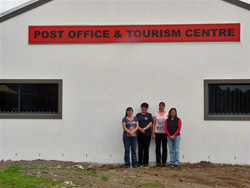 Situated in the west of the settlement, the Post Office and Tourism Centre is the hub for the island's visitors and tourists, as well as a social venue for the islanders themselves. Apart from the Post Office, it hosts the Gift Shop, where visitors can buy local handicrafts and souvenirs. Café da Cunha is also situated in the Post Office and Tourism Centre. 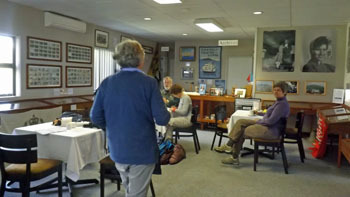 It welcomes visitors for refreshments, which can be consumed at tables within the island's museum. The display cases contain images and artefacts from throughout Tristan's history, and there are larger exhibits ouside in the grounds of the Centre. 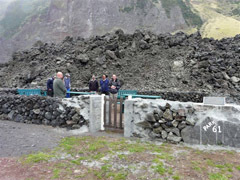 The Thatched House Museum is sited between the east of the settlement and the 1961 volcano. 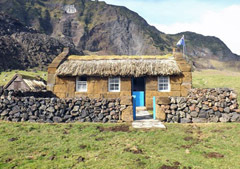 It is a traditional Tristan cottage newly built from volcanic rock and thatched with New Zealand flax. It is lined inside with painted wood, which in the past would have been salvaged from shipwrecks, and furnished in traditional style. It even has a traditional outside privy! The museum was opened in 2012 and is available for overnight stays. Looming alarmingly close over the east of the settlement is the parasitic volcanic cone and lava flow whose eruption in 1961 led to the evacuation of the population to England for two years. Now that it is no longer active, there is a path to the summit, which tourists can take on organised hikes or on their own. Beside the volcano is Volcanic Park, a place for peace and quiet built to commemorate 50th anniversary of the eruption. 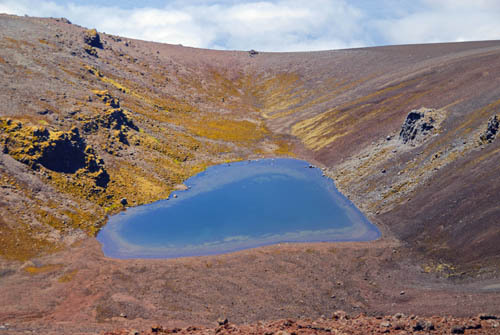 Tristan da Cunha's 2062m high Queen Mary's Peak is a mecca for lovers as it offers a stunning view of its heart-shaped crater lake. Reaching it is a labour of love though, because it is a perilous hike that can only be undertaken during longer visits in good weather with island quides. More accessibly, the islanders knit traditional love socks threaded with coloured stripes that convey hidden romantic messages for your loved ones. There are a number of other attractions available to tourists. Visitors can wander at will around the settlement and across the settlement plain, or take part in organised walks. Geocachers can follow the British Garrison Geotrail that links sites associated with the settlement of the island in 1816. Golfers can play a round on the course in American Fence and earn the sought-after Golf Club tie. See also the excursions page.